Back then, when it came to visitor experiences, it didn’t get much better than climbing The Rock. Today, both Parks Australia and Charles Darwin University (CDU) are saying climbing offends Uluru’s traditional owners. Climbing has become a No-No. Are Parks just taking the easy way out? Is CDU lending its name to claims that cannot be sustained? CDU says it is not. It’s a conundrum with a big dollar sign attached to it. “I climbed the Rock” was the proud boast of hundreds of thousands of people who, over the years, bought T-shirts with this inscription, wore them, fondly remembered their adventure and – coincidentally – became part of a world-wide promotion of one of Australia’s greatest natural wonders. Today climbing the Rock has not been banned, although Aboriginal activists have frequently threatened to do so. But lest they are regarded as insensitive, a lot of visitors are giving the climb a miss. 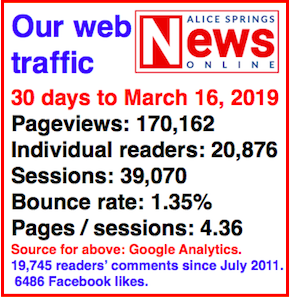 And while Parks claims that 80% of visitors are happy with what’s offered, there seems to be no answer to the question of how many are staying away from the Uluru Kata Tjuta national park because they are not meant to climb. Parks Australia, a Federal instrumentality, beyond briefly quoting two identified traditional owners, will not give further detail on how they came to have made this decision, whom they consulted in the process of making it, where and when, and how the question was put to them. For example, did Parks take into account that they would diminish the enjoyment of the park for a lot of people; that the earnings by the traditional owners from gate money would be reduced? CDU says it simply passes on to its trainee guides what Parks tells them to. 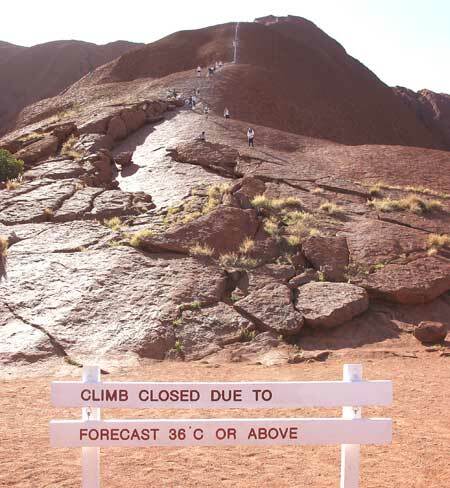 Parks, which took over the management from Northern Territory authorities (without their consent) in 1986, makes no secret that allowing visitors to climb is placing a strain on its staff and management. They clearly would like to shut down the climb. The current 10-year plan is long on protection of Aboriginal culture, and of flora and fauna and other environmental considerations. But it is very short on the significance of the park as a tourist attraction and as an important element of the Territory economy: These are clearly secondary considerations. The plan requires “account to be taken of … the interests of the traditional owners of the park, any other Indigenous persons interested in the park, any person who has a usage right … that existed (or is derived from a usage right that existed) immediately before the park was declared. “Joint management is the term used to describe the working partnership between Nguraritja [the traditional Aboriginal owners of the park] and relevant Aboriginal people and the Director of National Parks as lessee of the park. The plan says “our aim” is that “a range of activities are provided that optimise the park’s diversity and the quality of visitor experiences, in a manner that continues to protect and promote Anangu interests and the park’s cultural and natural values. Over the years the huffing and puffing about climbing has reached absurd heights: For example, the ascent by Bromley turned into a major scandal. Bromley is a bear in a children’s book. Parks requires tour guides to complete a course before being allowed to work there. This “blended course” is provided by CDU, mostly online, “self paced” and typically takes from a couple of weeks to six months, according CDU. Says Parks: “A key interpretive message taught in the course is that traditional owners and Parks Australia ask that visitors respect culture and not climb. “Students are taught to see the country Anangu way to help explain to their visitors the relationship between the land and people. The course is offered by Charles Darwin University and this brings up the crucial question: From where did CDU get the information that “Anangu” don’t want visitors to climb? A university puts its good name on the line when it teaches facts: These need to be carefully researched, meticulously sourced and documented, peer reviewed and published in reputable journals. There is no shortage of excellent precedent for this in CDU’s region, with people like TGH Strehlow, WEH Stanner, Olive Pink to name a few legendary researchers, not to mention current workers in the field, setting benchmarks for study of Aboriginal culture. We asked CDU about how it put together the course material. An exchange of some 20 emails ensued between the CDU, Parks and the News since last October. 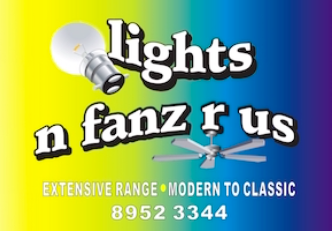 We soon hit a snag, being told by CDU that under the “contractual arrangement with Parks … CDU is not permitted to disclose any confidential information … without the Director’s prior written approval”. Parks then cleared the path for CDU to answer our questions. Eureka! “The two separate courses are taught using a broad range of resources some of which are developed by Parks Australia with the assistance of CDU, such as the [Park] Knowledge Handbook. “The content of this handbook is provided by Parks Australia, based on the park’s board-approved management plan. “The question of whether to ‘climb or not’ … is an individual’s personal decision. We suggest the guides consider … the wishes of the traditional owners (as conveyed by Parks Australia through their website and printed materials),” says CDU. So here we have it: The ‘anthropological’ evidence which CDU is teaching its students is what its paying customer, Parks Australia, is supplying to them, seemingly pushing their own agenda. It is not what the university’s own academic endeavours have unearthed. CDU, it seems, is putting its imprimatur on findings suiting a paying customer while ignoring academic research principles. However, it’s not that simple, says CDU: They are a “dual sector” university, offering higher education as well as VET (vocational and education training) courses. Research principles applied to higher education are different to VET courses “whose contents are determined by industry. We’re also delivering hairdressing and beauty courses”. The course for the guides is a VET course. The knowledge it contains comes from Parks, simply passed on by CDU to the course participants. In its management plan 2010 to 2020, Parks quotes the names of just two traditional owners on the subject of climbing: Kunmanara Nguraritja (“This is the proper way: no climbing”) and Tony Tjamiwa (“Climbing is not a proper tradition for this place”). If there is not a range of other views on this subject then this fact needs to be reliably documented – but don’t look to CDU for doing that. I had the opportunity of speaking with Paddy Uluru early in my work in Central Australia (I arrived in December 1974). Mr Uluru was the undisputed custodian of The Rock at that time. Mr Uluru told me if tourists are stupid enough to climb the Rock, they’re welcome to it. For him there was nothing of practical value up there such as water, game nor edible plants. He made it clear that knowledge of certain elements of the Rock’s dreaming must remain secret, to be known only by a strictly defined circle of people. That knowledge would be passed on to outsiders at the pain of serious punishment and perhaps death. But the physical act of climbing was of no cultural interest, Mr Uluru told me. Maybe then, this is what the “don’t c limb” campaign is all about (also quoting from the management plan): “Considerable resources are dedicated to managing the climb and to related health and safety issues. “Maintenance of the park’s vertical rescue capability requires that the numerous staff involved undertake intensive external training and regular in-house training. “Each time an incident occurs several staff and emergency personnel are involved and helicopters are often utilised. Translation: It’s all too hard? The park is Federally funded. It had an operating cost of $15,306,000 in 2013-14 and received external revenue of $6,778,000, largely made up of ticket sales. PHOTOS: Visitors climbing The Rock in 2010 • The Petticoat Safari in 1957, (pic courtesy Edna Saunders) • Climbers ignoring the closed sign • What should get priority: Arguing about climbing or the doing something about the infestation of buffel grass around the world famous monolith? I climbed in those time it was called Ayers Rock. I have seen it since last time I was there, they wanted $30 to climb the Rock which I refused to pay, being an Australian. If people can’t climb the Rock a lot of people will not come. I fail to see why Federal government is putting money into it. 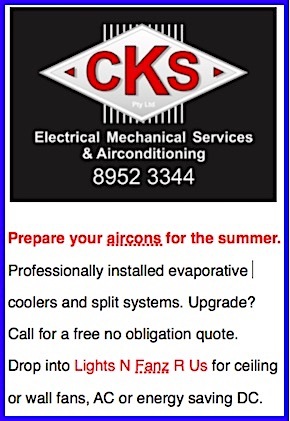 The traditional owners can help. It was only a few years ago people were reluctant to stop at Litchfield and Kakadu national parks because they had to pay. It will put a big strain on local businesses. I am from the US. What has hit me squarely between the eyes is the realization that Liberals and environmentalist “wackos” exist everywhere. What also amazes me about this discussion is how, generally speaking, these people are Humanists and they, at every opportunity, will tell you that people who believe in religion or a God are complete idiots. EXCEPT, when it comes to NATIVE populations and then, above all things, their beliefs and rituals should be respected and never questioned. So, if Christian belief is that God created the heavens and earth they are mocked and criticized but if the Anangu say that Uluru was “created by the activities of ancestral beings in creation time”, well now, that is perfectly believable and we should all respect that. I suspect that science – that thing that environmentalists and humanists love to use all the time – can or has proven that The Rock has probably been here longer than Australia has been inhabited by people. It is a geological formation and they should have no more claim over it than our “NATIVE Americans” should have on Lake Michigan. BTW, I was born in the USA so I am as much a “NATIVE” American as any other “Native American” living today. Visited in 2013 and was a perfect day to climb but was not allowed. So disappointed after flying over the top. I really wanted to climb it so we visited the park only to be told that the climb was closed. Would not have gone if I knew we were not allowed to climb. I think perhaps the very long term locals do know the truth. I mean the very long term locals not someone whose family has only been here for a couple of generations. Just yesterday really to a large portion of our population. 40000 years is a long long time. Native title is a oxymoron the land is still Commonwealth land it still belongs to the people of Australia. National parks is a government department full of environmentalist with the primary goal of closing everything to the people of Australia. We vote in these apologists who instead of representing the people and what is in the best interest of all they bow down to extremist who have no desire to share with the rest of us our lands beauty and splendour. I have never had a desire to climb the Rock but I find it absolutely absurd to close it to those wish to. Go back and you will find it was national parks personnel who convinced the native title holders to close the Rock and low and behold told them all about their sensitivities too. That is the problem with very long time locals we know the truth. I climbed Kilimanjaro in Africa, Mayon in the Philippines, Masada in Israel, walked through Pompeii, kissed the Blarney Stone in Ireland and at Aushwitz visited the gas chambers that struck me with disbelief of how a human could do this. Around 1980 I climbed the Rock and was totally in awe with the feel of the surface and the panoramic view. I would not have gone to these places if I could not experience what I experienced. There really is nothing else to see at the Rock and I would not be surprised if climbing it is forbidden then people visiting it will drop to a trickle. It’s very interesting to look at the foreground of the photos in this article. What stands out for me is the dominance of buffel grass on the flat area across from the climb, and it looks like buffel grass is the main vegetation in the fissures of the rock at the base of the climb, too. The photo taken in 1957 shows only native grasses, including a spinifex clump partway up the climb, and other native plants. Buffel grass didn’t exist at Uluru at that time. It’s sadly ironic. 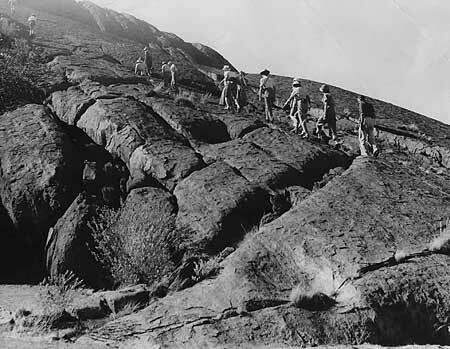 The major reason for the establishment of Ayers Rock-Mt Olga National Park in 1958, followed by other parks and reserves across the Territory in the “bad old Commonwealth days” was to protect these major environmental and historic assets from damage due to vandalism and souvenir-taking from the increasing numbers of visitors to these sites. As visitor numbers increased dramatically in the 1960s and 70s, other problems began to emerge. 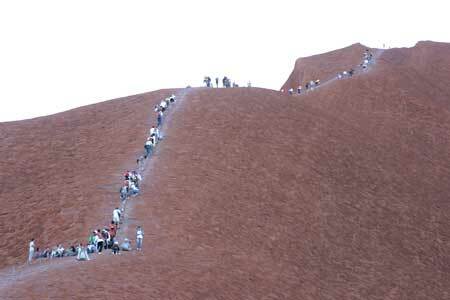 At Uluru, in particular, soil erosion from increased vehicle and foot traffic became a major problem. As a consequence buffel grass was established in these problem areas as a means to tackle this problem. This was a standard practice of soil conservation in Central Australia for many years. These well-intentioned measures were highly effective at Uluru. I’ve got an article published in 1984 written by a leading local agronomist of the 1960s who surveyed the results of buffel introduction work across the Centre. He expressed amazement at the speed at which buffel grass had taken hold in the national park, it was one of the most “successful” sites of all he followed up on. 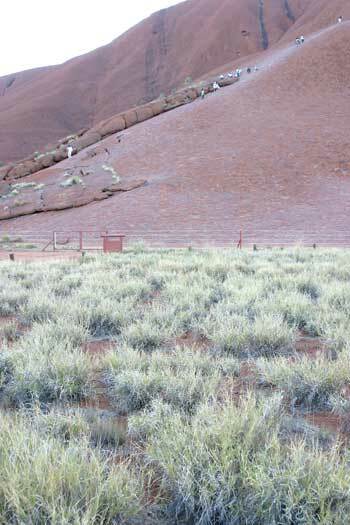 In the past decade or so there have been valiant attempts to reverse this situation, most particularly with Conservation Volunteers of Australia (typically comprised mostly of eager young workers from overseas) working hard over a number of years to eradicate buffel grass from around the Rock. Presumably there is still a long way to go. There are just so many things to do and see in Australia and the rest of the world that the Rock is starting a pale somewhat. Keep in mind the it existed for 99.9% recurring before humans claimed it. In fact, as a naturalist I beginning to find any claim of human ownership towards natural wonders contrary to what I used to believe. I think people will just find something else to do. Definitions … I thought the definition of a National Park was very clear! an area of countryside, or occasionally sea or fresh water, protected by the state for the enjoyment of the general public. The definition of a national park is a public space maintained by the federal government which preserves nature, history or science for visitors. A tract of land declared public property by a national government with a view to its preservation and development for purposes of recreation and culture. The park is Aboriginal land, and they have asked us not to climb – for a lot of reasons. The park is only leased and is not owned by the Commonwealth. 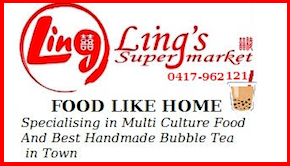 It is not a site which is owned by all Australians, this is simply not true in any sense of the word. I certainly enjoy visiting the park without climbing it, and have taken friends and family out who have also enjoyed the experience without climbing it. The resort isn’t struggling for guests, and it seems that the majority of guests aren’t climbing it. I don’t think its going to scare away too many people, especially as the place is marketed as a cultural and natural site. Why do we think we are able to decide how an attraction on private property is run and marketed? 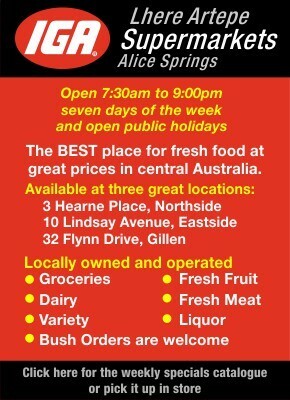 I don’t get to decide who are the tenants in the Alice Springs Plaza because I don’t own it, and its not public property. This is the same as Uluru / Kata Tjuta. The numbers speak. If they want revenue then it needs to be open. If that’s not important then close it. Would you go to the Great Barrier Reef if you couldn’t swim? Would you go the great wall of China if you couldn’t stand on it / walk it? As we’re aware, the Rock is along way out of the way. If people are to spend the money and take the time to go, let alone go more than once, it needs to be worth while. I have taken seven trips there in the last 18 months with visiting friends / family, all said it was amazing to look at but disappointed it was closed (every time) to walking. I’ve stopped going referring them to the local tour guides. Twice since then, friends have evaluated the time and cost and declined. Like it or not, it’s our reality. Erwin, people don’t avoid climbing the rock in order to not appear insensitive, they do so because they know it’s insensitive. Perhaps if people were to stay away because they could not climb, then the significance and beauty of Uluru and Kata Tjuta would be lost on them. We visit places of cultural importance to learn, if not also to exchange. The type of people you hypothesise don’t fit into this category. Your article questions the strength of wishes of two traditional owners when advising Parks of its sensitivities regarding Uluru, but why does it need to be questioned? Do you not understand that however “brief” the mention of traditional owners, if they have expressed a wish then that wish stands. They do not have to express those wishes in a manner that suits you, nor any other white person. Surely you understand this. Some people have no concept that The Rock is a natural wonder that’s millions of years old and created by the forces of nature. It is not a specifically built monument, constructed to uphold the beliefs of a minority few as are the structures mentioned in earlier posts. There is no comparison. The whole concept that an ancient natural wonder is “owned” by a particular ethnic group smacks of social engineering at its worst. Sure, this group should have the undeniable right to maintain traditional ties and spiritual beliefs associated with their culture at The Rock. However this culture should not be forced upon or indoctrinated onto every citizen of the world who wishes to visit there in search of other pursuits. The Rock is a magnificent work of nature. It should be enjoyed by all who visit without the restrictions cobbled up by some whitefellas air-conditioned style of management. My father travelled extensively through the southwest region of the NT in the late 1950s-early 1960s on botanical survey trips with George Chippendale, the NT’s first resident botanist. On occasion they met Bill Harney, the first ranger stationed at Ayers Rock – Mt Olga National Park as it was originally known (the Territory’s first national park). Harney was known world-wide for his books and yarn-spinning (talking, for the uninitiated!) – he was the earliest great promoter of the NT, in many respects. I digress. My father observed how Harney was often asked by visitors what the view was like from the top of Ayers Rock. Harney would elaborate at great length what could be seen from there. One day my father asked Harney how many times he had climbed the Rock – the response was he had never climbed it, he relied on what tourists had told him! Recently I read a short item published in the Centralian Advocate in 1962, soon after Harney retired as ranger at the Rock. Harney described how fish could be found in one of the small waterholes at the top of the Rock after each time it rained sufficiently to fill it. Aboriginal people had a name for these fish which would indicate they climbed the Rock – how else would they know? It’s long been known that there are highly significant sites for Aboriginal people at Uluru; however, I know that Aboriginal people in recent decades readily climbed to the top of the Rock – I’m aware of a photo taken a few decades ago of a group of Aboriginal women (who came from the far north of South Australia) at the top of Uluru who had not hesitated to climb it. Would we abseil down the ancient facade of Sacre Coeur? Climb the outside of St Paul’s Cathedral or walk a trail of tourists up and over the outside of the Al Aqsa Mosque in Jerusalem? There would be an outcry! It would be considered sacrilegious, and it is. That we even consider the possibility of doing the same over the sacred site of Uluru shows how ignorant most of us are about what matters. Come on people, get with it! I have climbed the Rock three times now, twice back in the early 80’s and again at the end of the 90’s. It is a fantastic view from the top and I really can’t see the reason to go out there just to walk around looking at it. Whilst that is good it has to be climbed to really appreciate the awesomeness of the place. And in the 90s it was so much more expensive. The place is a rip off if you don’t climb it to get the full experience. If people can’t climb the Rock a lot of people will not come. I fail to see why Federal government is putting money into it. The traditional owners can help. It was only a few years ago people were reluctant to stop at Litchfield and Kakadu national parks because they had to pay. It will put a big strain on local businesses.